Description: Erect tufted perennial to 0.8 m high, swollen and densely hairy at the base. Leaves with sheath ± hairy; ligule 2–3 mm long; blade 3–6 mm wide, often sprinkled with tubercle-based hairs. 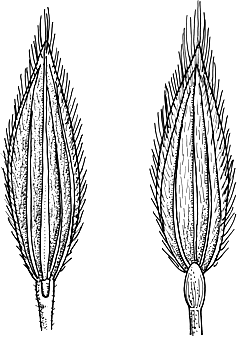 Racemes spreading at maturity, the lower 8–35 cm long, common axis to 10 cm long, spikelets mostly in pairs or the lower sometimes solitary, the pairs mostly remote; shorter pedicel 1–4 mm long, the other 4–20 mm long. Spikelets 3.75–5 mm long, ± hairy, the hairs at first appressed, at length spreading but not or scarcely concealing the outline of the spikelet. Lower glume 10–25% as long as the spikelet, not or very rarely remote from the upper; upper 3-nerved, slightly shorter than the spikelet. Sterile lemma equalling the spikelet, 5–7-nerved. Fertile lemma a little shorter than the spikelet. Distribution and occurrence: Grows in woodland on better soils; widespread.